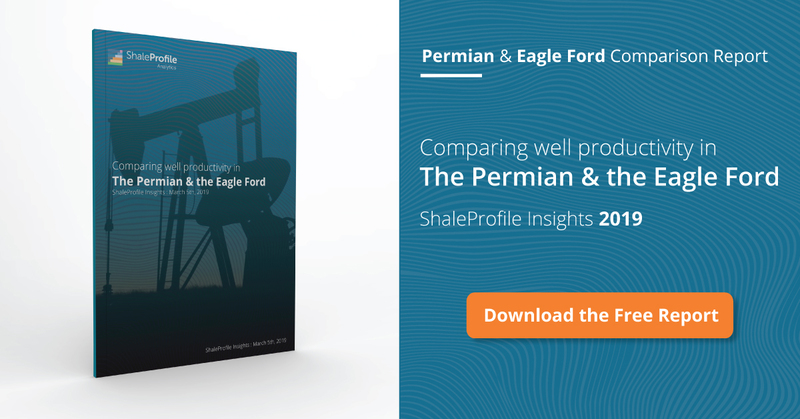 These interactive presentations contain the latest oil & gas production data from all 19,523 horizontal wells in the Permian (Texas & New Mexico) that started producing since 2008/2009, through December. December oil production came in at around 3.1 million bo/d (after revisions), 1 million bo/d higher than a year earlier. Close to 4,400 horizontal wells were completed in 2018, 23% more than in 2017. As is represented by the blue area in December 2018, about 2/3rd of December production came from wells that began production in 2018. If you switch ‘Product’ to gas, you’ll find that natural gas production increased to almost 10 Bcf/d, which is even more than is produced in the Haynesville Basin. The final tab shows the production histories of the 5 largest operators of horizontal wells. They all have strongly increased output in the past 2 years, and are at or near production highs. The wells that started in Q2 2016 (dark brown curve) have now recovered the most oil, with just over 200,000 barrels of oil produced on average. Newer wells are on a slightly higher trajectory. In the 2nd tab you’ll find all counties in the Permian, ranked by cumulative production, from horizontal wells since 2008. Reeves has taken over the 1st spot from Lea County, with 340 million barrels of oil cumulative production. Close to half a million barrels of oil per day were produced in Reeves in December. Later this week we will have a post on the Eagle Ford, followed by an update on all covered states in the US early next week. Texas RRC. Oil production is estimated for individual wells, based on a number of sources, such as lease & pending production data, well completion & inactivity reports, regular well tests, and oil proration data. NG has increased by 3.1 BCF/day YOY. Eyewitnesses report a lot of flaring. Texas RRC seems to be turning a blind eye towards this. And NG is getting negative values. I am convinced NG handling will be the rate limiting step for oil growth. Exxon, Chevron and Oxy’s productivity improvements are impressive. With 0.75000 NRI’s and $9MM well costs (avg. for both basins), the magic number to payout is 430K BO at $50 net WH prices. A lot of 2016+ wells will make that and I assume eek out enough to pay for the 2016- wells. Chevron’s magic number with 0.95000 NRI’s (across 1.7MM acres? ), same well costs, is <300K BO. They'll rock. I liken the these big guys returning to the Permian as salmon swimming up river to eventually die. In the mean time, however, with diluted interest expense per BO, diluted G&A/BO, better NRI's (Chevron) and a lock on services and pipe to get the stuff out of the Basin, they'll make some money…as long as OPEC helps, sanctions don't get lifted, and more overleveraged oversupply from independents doesn't drive the price down. Again. Thanks Enno! You rock too! Perhaps that’s what you mean when you say, they rock! In comment above I assumed $50/bo at the well head for the 93 month payout of a $9 million well. I am pretty sure Mike is talking about Chevron. They have 95 % NRI. They own most of there minerals in fee. They have an awesome advantage. Only around 5 percent goes to royalty owners. If Chevron can’t make money no one can in the Permian. Phantom, thank you; that is exactly what I meant. High NRI’s make a BIG difference in PB economics. Thanks. I did not know what NRI was. So essentially royalty payments are close to zero for Chevron with NRI (= net revenue interest) of 95% (so only 5% of wellhead revenue needs to be paid out as royalties?) So my math applies to the operators with NRI=0.75 because my standard assumption is 8% severance taxes and 25% royalties for 33%. My apologies, another thing learned, I agree now that I understand. I get payout at $46/bo at the well head at 291 kbo at 64 months for a Delaware basin wolfcamp well at $10 million well cost, discounted net revenue is equal to $10 million in 2019$ with a 10% nominal discount rate (assuming 2,5% inflation) over the life of the well this is for Chevron assuming 0.95 NRI. For midland wells at $8 million well cost and the same well profile assumed it would be a $39/bo price at wellhead and 282 kbo to reach payout, no idea where Chevron operates in Permian (some articles I looked at suggest most of their acres are in the Delaware Basin where average well cost is higher). Exxon has a bigger position in the Midland Basin where well costs are lower. For XOM I get discounted net revenue equal to $8 million (10% discount rate) at a well head price of $50/bo and payout at 287 kbo at 62 months, total cumulative output is 384 kbo over 160 months with well shut in at output of 16 bo/d, where we assume a Midland basin well with an average cost of $8 million in 2019$. -2 per MCF for the gas in PB. Quick data question for you. It looks like historical production numbers for certain vintages are changing. Ie 4Q15 vintage previously listed 179,188 in Month 34. Now Month 34 lists cumulative production as 173,874. Does the Texas RRC revise their data up/down over time? In the past several months we have worked on a new method to process Texas data, which allows us an easier path to implement many more improvements in the future. We have just switched to using this new method. We did see that this caused some differences with the previous results (Permian & EF), and we will analyze them in the coming days/weeks. In general the new version should be an improvement, as it uses a little more recent well data. Besides that, the TRRC does always revise data, both up and down. But probably the main reason for seeing some differences is the point mentioned above. Got it, thanks for the response, very helpful.